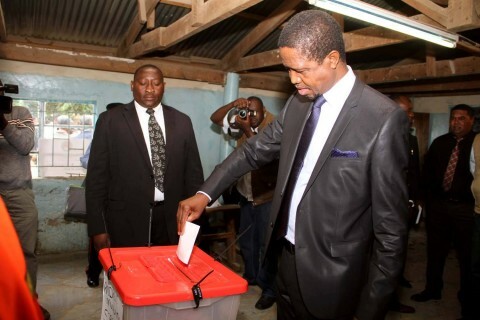 President Edgar Chagwa Lungu casts his vote at Andrew Mwenya Polling Station in Lusaka's John Howard Township on April 14,2015. The Electoral Commission of Zambia has revealed that it has commenced preparations in redness for the next general elections which will take place in 2021. ECZ Chairperson Justice Esau Chulu says the commission will undertake delimitation exercise that will see the demarcating of constituencies, wards and poling district boundaries. Justice Chulu says the process is a pre-requisite to voter registration and is cardinal in reducing the distances to polling stations that the electorate needs to cover. Speaking during the launch of the ecz’s strategic plan for 2018 to 2022, dubbed “efficient and credible delivery of elections”, Justice Chulu says the commission is exploring the implementation of an online voter registration system to accommodate the technological savvy and those with limited times to visit Voter Registration Centres. He says this is because the majority voters in the next general election will be young thus the need to explore the implementation of an online voter registration system. Justice Chulu insists that the commission is committed to adopting electoral reviews that will help it provide better and efficient elections in future. And justice Chulu says the 2018 to 2022 strategic plan establishes the platform for implementation initiatives that will facilitate processes, leading up to the 2021 general elections and beyond. He has stated that the strategic plan will address enhancing stakeholder confidence and participation in the electoral process through regular engagement and awareness programmes among other issues. And speaking when launching the electoral commission of Zambia 2018 to 2022 strategic report, Chieftainess Mwenda says the launch of the strategic plan is a land mark milestone that is essential in demonstrating unity of purpose and in institutions in Zambia.